Just showing off tonite's menu. Recipe posted earlier here. These two days have been busy layering cakes and many other things. In the meantime enjoy the photos (not too satisfied that the layers did not turn-up evenly, too rushing...) . Only managed to update the recipe today 2nd Jan'09. Sorry to keep some of you waiting. I found the recipe in Nomie's blog. 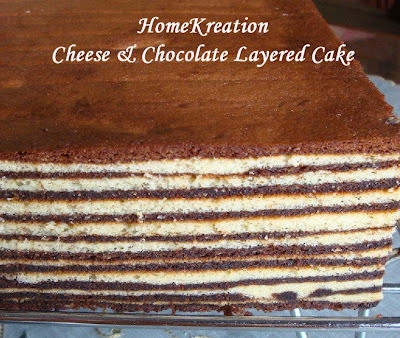 I was looking for a very cheesy & chocolaty layered cake but this one tastes rather plain & not so rich but a bit sweet. Anyway, it was quite simple to make with not too many eggs used. 1. Beat all Ingredient A until white & thick. Beat Ingredient B & C in a separate bowls. Divide mixture A into two portions. Add mixture B & C into each portion. 2. Grease & line tin. Grill a layer of chocolate mixture, alternating with cream cheese mixture until finish. 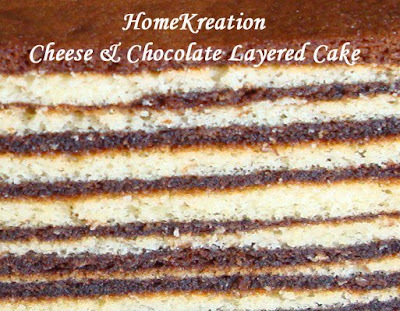 Start & end with chocolate layer. I spent whole day in the kitchen today to make this cake. I'll post the recipe later, so watch out. 1. Place all Ingredient A in a bowl & beat high speed until white & thick. 2. In a separate bowl, beat ingredient B until white & fluffy. Add into Ingredient A & mix well. Divide into 3 portions & color each red, green & original. 3. Grill red portion layer by layer in 9"x9"x1" tin until finish. Then Grill green portion layer by layer in a separate 9"x9"x1" tin until finish. 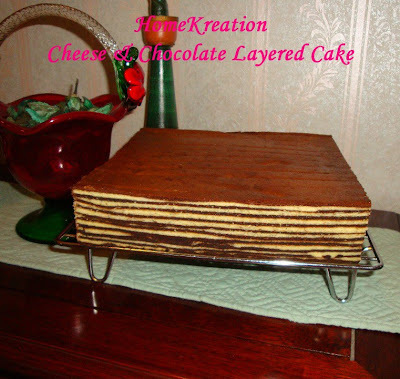 Once the cakes are cooled off, cut into ¾" width strip & then slice into triangle shape. 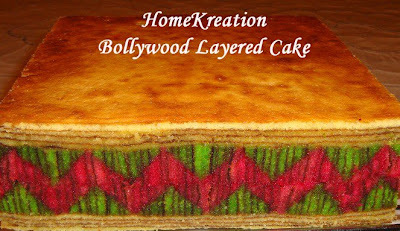 Arrange the green & red strips into pattern like the cake photo above & glue with jam. Wrap the pattern blocks in plastic paper & freeze to stick them well. 4. Divide the original color batter into two parts. Grill the first part in a 8½" square tin until finish. Spread jam on top & arrange the pattern blocks. Grill the remaining half of the original color batter layer by layer until finish. 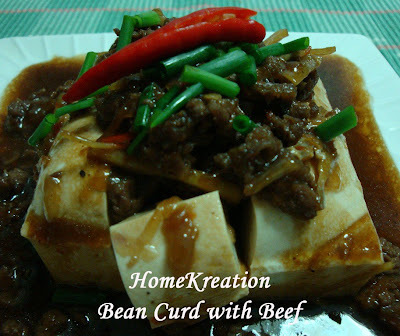 I have an extra bean curd and some beef in the fridge so I thought that they are a good combination. So here what I came up with. 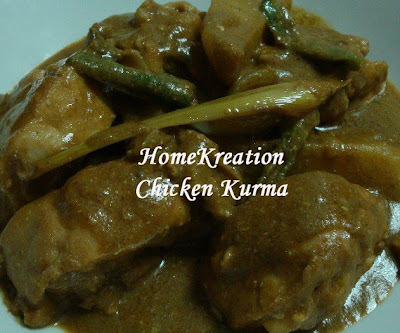 I also cooked chicken curry and the family enjoyed both dishes with compliments. 1. Heat up 2 tbs oil in a flat pan. Fry the pounded ingredients*, ginger & minced beef. Pour mixed sauce & black pepper. Place the beancurd in the pan & cover for about 5-10 minutes. 2. Dish-up & garnish with spring onion & sliced chilli. 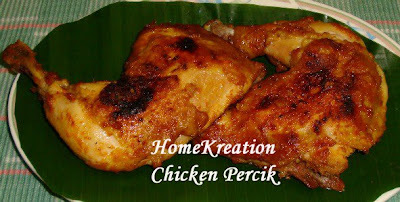 My children love chicken and it is a must dish everyday. For Hari Raya yesterday, I created a new recipe in attempt to have something special for the children. Not only my children who enjoyed it but my hubby too. 1. Rub chicken with ginger, garlic, black pepper & salt. 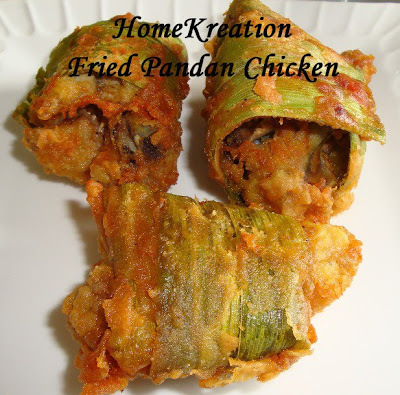 Wrap each piece of chicken with half piece of Pandan leaf & secure with a tooth pick. Marinate for an hour or more. 2. Mix rice flour, plain flour, turmeric powder & a pinch of salt with water to form a runny batter. Dip the wrapped chicken piece with the batter. This was our special meal on Hari Raya (Idh) yesterday. 1. 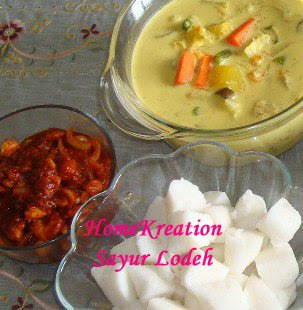 Place in a pot, coconut milk, potato, carrot, pounded ingredients*, turmeric powder, lemongrass, salt & msg. Boil until potato & carrot are soften. Add in the rest of vegetables & cook until it boil again & off fire quickly. 2. Boil instant Nasi Himpit per packet instructions. I prefer brand Lazat as it is prewashed & solid texture when cooked. Cool & slice before serving. 3. 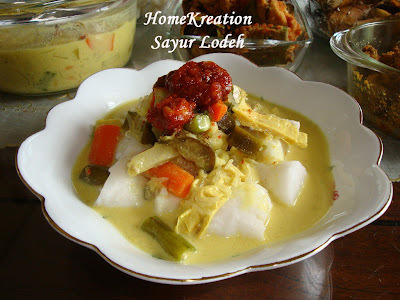 Serve Nasi Himpit with Sayur Lodeh and Sambal. 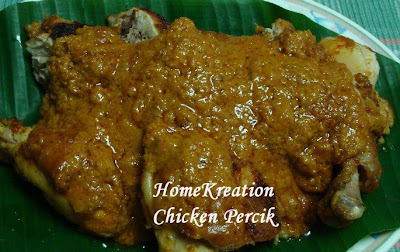 Refer here for sambal recipe. You can use Ikan Bilis or shrimps as you like. 1. 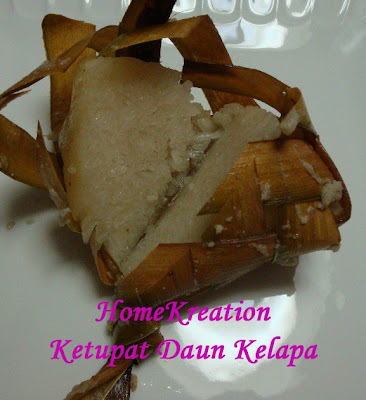 Fill ketupat cases with glutinous rice. Leave a thumb pinch of empty space at one corner to allow the rice expand. Too tight will cause the ketupat uncooked and too loose will cause it too soft. 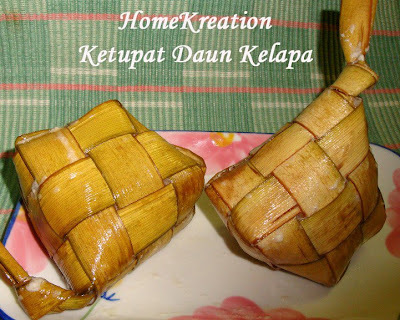 Ensure that both ends of ketupat are slit through & knotted to prevent it from opening during cooking. 2. 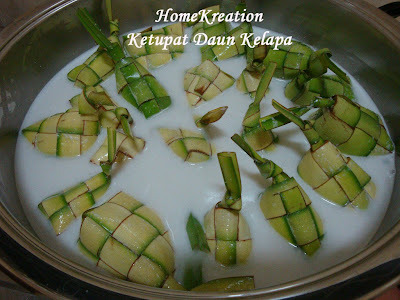 Place all the filled ketupat in a big botom pot & cover with coconut milk sufficiently (see above photo). Add in salt & screwpine leaf. Boil until coconut milk is completely dry and oil surfaced out. 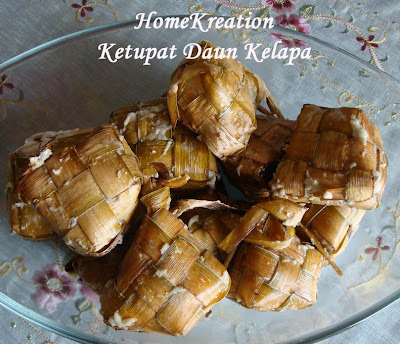 During the cooking process, flip the ketupat frequently to ensure even cooking. 3. Serve with your favourite Rendang or curry. 4. 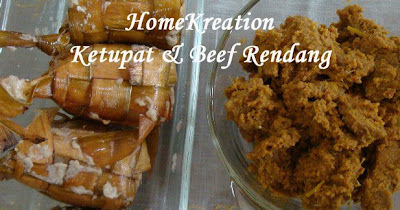 The Ketupat can keep for 2 days if properly cooked. 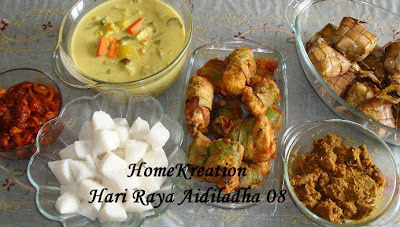 Hari Raya Aidiladha is a quiet occassion in Miri unlike in Peninsular Malaysia, which is celebrated with open houses and lots of special delicacies on the day. For our family, the routine is to visit mosque first thing in the morning for Hari Raya prayer. After prayer my husband instructed us to gather in the lounge for Raya hugs, followed by photo session and finally Raya breakfast. I did not cook a lot as we do not expect any guest this year. 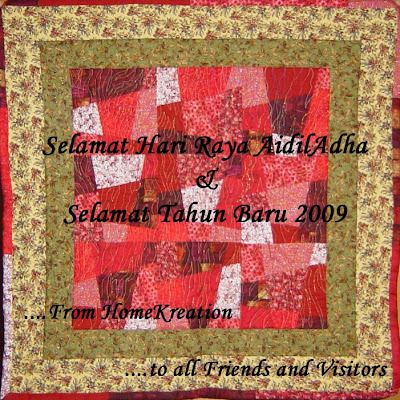 Our relatives have all returned to kampung to celebrate Hari Raya in conjuction with school holiday. This year my hubby & children helped a lot in the preparation as Lela is no longer with us and that put the family closer together. 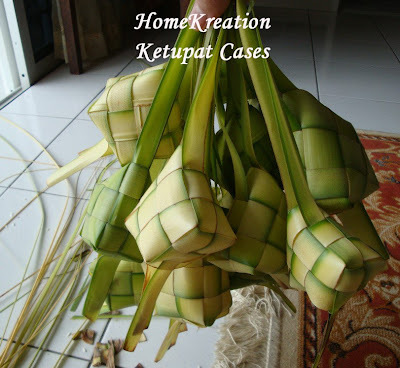 My youngest son proudly told his grandma on the phone that he helped me to fill up the ketupat case and other things he did. 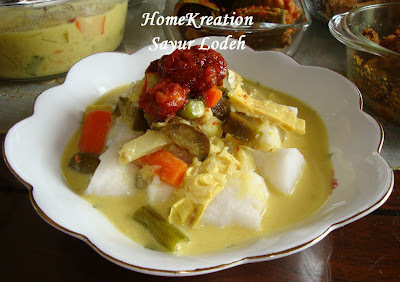 Sayur Lodeh is actually greeny in color but my camera has always not successful in producing the real color for green curry (it looks pale compared to the real color). Clearing my last batch of bananas, so this morning made two types of pancakes. 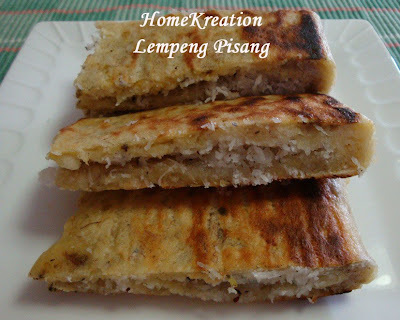 One was the earlier posting & this one is the traditional/kampung style pancake which has sweet coconut filling, called Lempeng Pisang. My mum used to make this when I was a kid. Mix all ingredients except coconut. Spread on a piece of banana leaf. Spread coconut on top & fold into half. Cook on a griddle until one side is cooked. 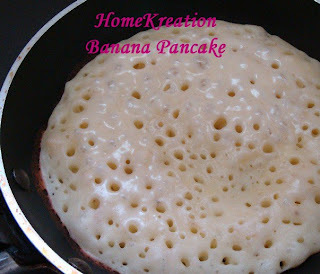 See photo below on how to cook the pancake. 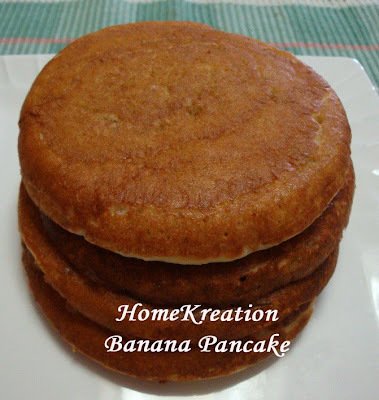 This Banana Pancake is light & fluffy. It is not very sweet, so it goes well with any preferred syrup & icecream. Recipe taken from AllRecipes. Mix in milk, oil & banana. Add in mixed dry ingredients & stir well. 2. Heat up pan & spread 2-3 tbsp. Cook until bubbles appear on the surface & burst (see photo below). Flip & cook the other side for 1/2 minute. 3. 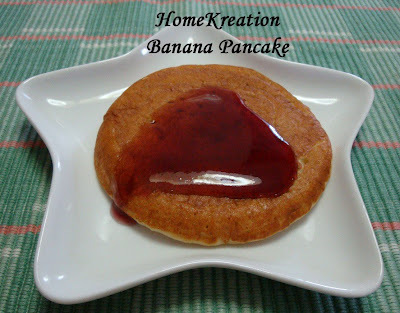 Serve with favourite syrup like maple, strawberry, blueberry, chocolate, etcs. Tonight made the same recipe again to please the children... 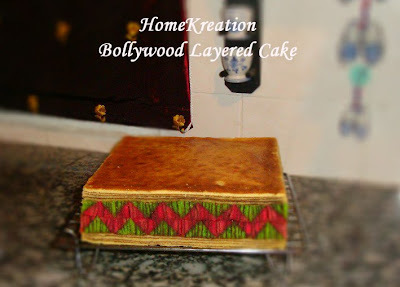 Previous posting & recipe, refer here. 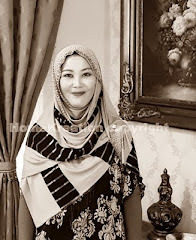 Kekawan yang singgah di sini, sila lah amik kad ucapan ini bawa balik ya (tapi kad bodo jer...), simpan baik2 buat kenangan. Thanks for your friendship...! 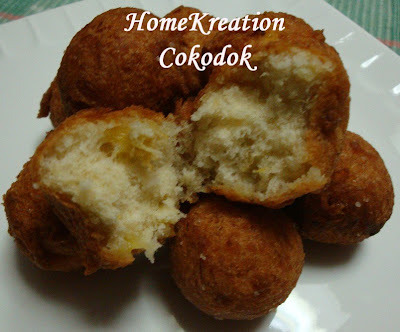 There is nothing fancy about Cokodok as it is a typical Malay kuih and I believe anyone can make this. There is no need for accurate measurement and you can simply add all ingredients to your taste. 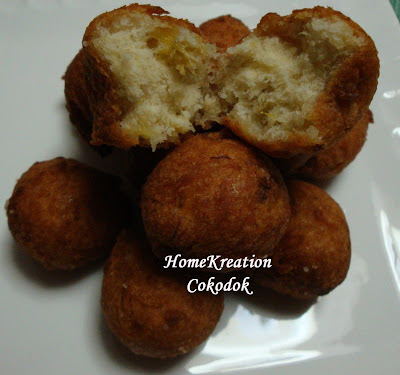 Add all ingredients with sufficient flour to form dumpling to be deep-fried. Deep fry until golden in colour. Makes sure you flip them all the times to ensure even color. Yesterday evening I attended company's dinner and was surprised when my name was called upon to receive the above bouquet of flowers from my Director as recognition in my initiatives in upholding the Women Network. I wish to share the recognition with few other colleagues who have never failed to provide ideas and support on all the activities that we organised (I'm sure they know who they are). Felt like having Rendang but wanted to try something different than my own recipe. 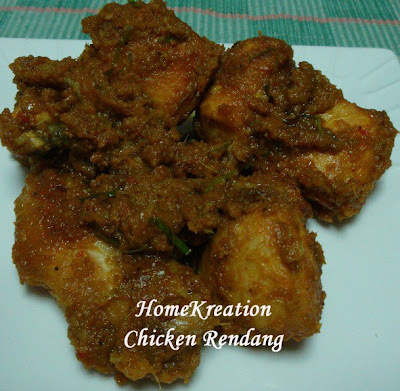 I recalled seeing Chicken Rendang at Hana's house using Amy's recipe. To my surprise, it is a lot easier than my own version as it uses a lot less coconut milk & hence dried up easily. Most importantly, it tastes real good...! 1. Heat up 1 scoop of oil & fry blended ingredients*, curry powder & turmeric juice until fragrant & dry. Add in chicken, sugar & salt. Stir occasionally until chicken is cooked & gravy is almost dry. Add in sliced Kaffir Lime leaves & Kerisik. 2. 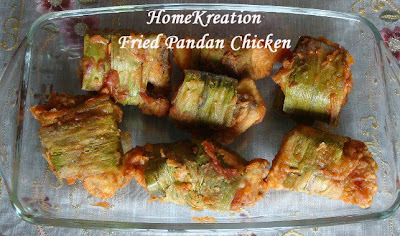 Serve with rice, glutinous rice or rotis.